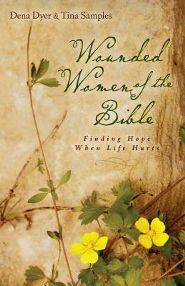 Wounded Women of the Bible is such a great book and bible study! I’ve recommended it to all of my friends and family. I absolutely love the style of writing and the way the authors, Dena Dyer and Tina Samples, relate each woman to real life, everyday struggles. The book can be read without doing the study but it is so much better with the study. With twelve women from the Bible, Ms. Dyer and Ms. Samples tackle tough issues like rejection, betrayal and desertion. By telling their own personal stories or the stories of other women, they relate these women from the bible stories and correlate them to contemporary issues. Wherever your heart has been wounded most, that particular story will resonate best. I found Wounded Women of the Bible to be so much more than storytelling. I found it to be a wonderful place to begin healing those wounds that run far too deep. I received this book from the Book Club Network and Kregel Publications in exchange for my honest opinion which I’ve provided here.